Florida has a unique ecosystem that includes rare and beautiful wildlife specimens most of us never get to see in their natural habitat. The next best way to get up close and personal with Florida’s fauna is to visit a local theme park such as Gatorland near Orlando. Here, fun and education are intertwined for groups of all ages. The self-proclaimed Alligator Capital of the World, Gatorland’s gator exhibits are a draw for visitors from all over the world. The collection includes American, albino, and baby alligators, as well as Nile, Cuban, and Saltwater crocodiles. Guests can safely watch gators and crocs in specially designed environments such as the Breeding Marsh, with regular showings for feeding time, jumping, wrestling, and up close encounters. There’s even a Trainer for a Day program for gator nerds who just can’t keep their distance. Gators aren’t the only draw at Gatorland. The park is home to several types of large wild cat, such as the Florida panther and the Florida bobcat. Rarely encountered giant tortoises have been part of the park experience since founder Owen Godwin first adopted a 400-pound giant tortoise named Albert back in the 1950s. Today three of the largest tortoise species – Galapagos, Aldabra Giant, and the Sulcata African Spurred – call Gatorland home. In addition to learning about Florida’s natural environment, kids of all ages can have a roaring good time at Gatorland adventure attractions like the Screamin’ Gator Zipline, which features 1,200 feet of line suspended from seven-story towers over gator habitats. Or, pile into one of three 12-foot high custom-built monster vehicles for a Stompin’ Gator Off-Road Adventure. These are just a couple of the unique experiences waiting for you and your family at Gatorland. Be sure to ask about the Gator Night Shine and Rookie Wrestling programs as well. 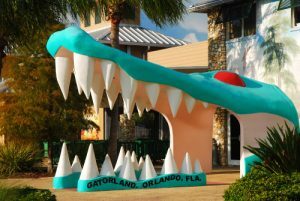 Next time you’re in Florida with the family or friends, make the Rosen Inn International your base camp for all the Orlando-area has to offer, including the naturally toothy wonders of Gatorland. Our friendly team can book your visit and advise which of the park’s many features not to miss. Then, after a long day adventuring with gators and crocs, refresh and relax with the Rosen Inn International’s many world-class amenities. Call 407-996-1600 to learn more.